UK Release Date - 16th November 1987. UK Release Date - 23rd November 1987 (Collector's Edition 12"). US Release Date - 6th January 1988. Producer - Def Leppard (Tracks 02/04). Producer - Ronald Prent (Track 03). Live Track 03 - Recorded 25th June 1987 in Tilburg, Holland. Special Formats - Regular CD1 - Song titles in yellow, other text in red. Special Formats - Numbered Limited Edition (1000 copies) CD2 - song titles in red, other text in yellow. Special Formats - Limited Edition 7 Inch with free sew on Hysteria patch. Special Formats - Limited Collector's Edition 12 Inch vinyl with 30"x40" Poster/UK Discography. Special Formats - Canadian Limited Edition 7 Inch Poster Bag fold-out sleeve. The third UK single from 'Hysteria' was released in November 1987. 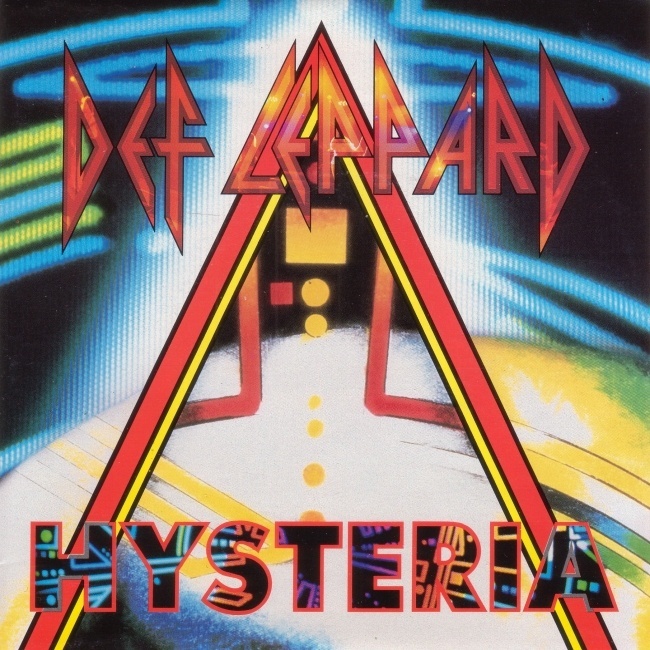 The title track 'Hysteria' was the first ballad released from the album and a major hit around the world. It reached number 26 in the UK and 10 in the US in early 1988. Up to seven different official single formats were released in the UK. Two CD singles were released with the same tracklisting in card sleeves. The first version had the sleeve slot on the right side, "C.D. Single" written at the top of the front sleeve, plain white back sleeve with the tracklisting in red and info in black. On the CD the info was all written in red and the song titles in yellow. The word "Hysteria" on the front was surrounded in grey. For the Limited CD version the top of the sleeve had "Limited Edition C.D. Single" on the right with the version number printed to the left. The slot to fit the CD in was at the top of the sleeve. The back sleeve was the same as the 7/12" singles with the tracklisting surrounding the five live band pictures. On the CD the song titles were in red and the information around it in yellow. The word "Hysteria" on the front was surrounded in red, as it is on the 7/12" sleeves. A UK 7" came with a free Hysteria album sleeve patch. In Canada a poster bag 7" was released featuring a promo pic and Lep logo on either side. A UK Collector's Edition 12" came in a card box sleeve with the regular 12" inside and a 30" x 40" colour poster. One side has five live pictures on a white background + Lep logo, similar to the regular back sleeve but different shots from the 1987 UK Tour. The other side has the UK discography up to this single. The single included a re-recording of an old E.P. track and 'I Wanna Be Your Hero' was used on the CD as the PSSOM UK release was only issued on vinyl. The song had been the B-Side to that on vinyl only. The first live song to be released from the Tilburg show was also included. Various promo 7" singles included a 4:44 edit version which fades out after Joe sings "Say You Will". It also has some of the guitar section edited out. "This is a song that appeared on our first E.P. We re wrote and re recorded it in the summer of 1987......spot the difference."